Two Fallouts in a row was a surprise. Rumors are that it's a multiplayer game with the premise of rebuilding after the war developed by Bethesda Maryland and Austin (formerly BattleCry Studios). 76 refers to the control vault where no testing took place. Kotaku's Jason Schreier is talking like he has insider info. Sooo happy its not another remaster. Need to see more to understand what this actually is. On the surface, looks like it uses similar assets to Fallout 4. PS4, Xbox One and PC is the only confirmed info so far. "Nintendo will most likely announce this at their own treehouse broadcast or direct." I hope it does come to Switch, but it all depends on the scope of this game I guess. @Shellcore Sure they will. Uhuh. Because getting to announce a game later than everyone else much to annoyance of users and leaving them feeling second rate just so you can have a special "Everyone look we have support" announcement is dumb. If any game is announced after the fact for no good reason other than to feel special then no, that's dumb. Just announce it at the same time. It'd be nice for a change. But no this isn't coming to Switch, ever. Dont even know why this thread is here to be quite honest given its never going to be on a Nintendo system in the foreseeable future. It clearly uses the Fallout 4 engine and after seeing that on PS4 you'd be damn insane to think it could run even docked. I think we can take for granted that new Bethesda RPGs aren't going to be on Switch. That's why I put it in 'other gaming' lol, I thought everyone knew. Anyway, there do look to be a lot of the same assets from Fallout 4, just looking nicer. It's hard to tell since the trailer was inside a vault and pre-war stuff always looks shiny. I wouldn't worry though, it's been 3 years and Bethesda games are never lacking in content. @YummyHappyPills Most metallic surfaces in Fallout have rusted from all the acid rain. Anyway, BGS never makes anything but RPGs. We'll have to wait until E3, but it's probably just one of those with coop. @YummyHappyPills I agree that it is still janky as hell on PS4. We still aren't sure what this is though. There are rumours abound that it could be a construction based game set purely in the vault itself. The personalisation of the vault in the trailer seems to hint at this (football pitch, various decorative loot items etc...). I wouldn't be surprised if this was a fully fleshed out Fallout Shelter. If that is indeed the case, Switch has a chance. More (like) New Vegas, less (like) Fallout 4 please. I really, really didn’t enjoy Fallout 4. It was a big step backwards after New Vegas, especially in the dialogue choices, the way the story branches out and the multiple ways of being able to complete a mission. 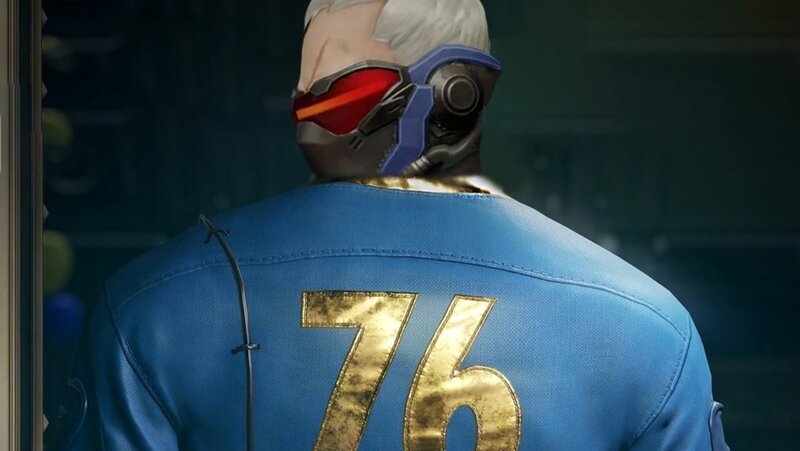 Schrier is tweeting that he thinks 76 isn't a traditional singleplayer RPG, but has some online components. Pretty vague, but coop in a Bethesda world is what people were asking before before ESO got announced. I'm interested to see their E3 show. Hopefully settlements will be improved, if they return. At the very least, they can iron out any new issues before trying them out in ES6. Save file corruption... yikes. I'm lucky; three playthroughs, and I've mostly just had the odd crash or minor glitch. I think it's kind of insulting how they're allowed to create and sell a reskined Dogmeat or backpack for $5, but they can't fix anymore bugs. But I hear ZeniMax has warped priorities. Doesn't Skyrim use the same engine? And Skyrim SE has some of the same improvements as Fallout 4, even on Switch. Or at least, that's my understanding. Skyrim is on the Creation Engine, itself a fork of GameByro which was used for Morrowind/Oblivion/Fallout 3. Fallout 4 is on an upgraded version of Creation, as I assume is the case with Skyrim: Special Edition. On the surface, looks like it uses similar assets to Fallout 4. Please tell me you're joking, right? I'm still waiting for Bethesda to announce that they've made a new engine. I'm no longer of the opinion that the old one was ever acceptable, so this game may as well not exist in my eyes if it's just gonna be another barely-functional glitchfest that the devs will never bother to properly upkeep. ...Considering there's rumors that it'll be an online multiplayer game, that may be quite apt. Anyway, interviews hold that Bethesda's new internal engine is being prepared for their next game after 76 but before TES VI. Basically next gen.
@CanisWolfred I know right?! If the rumours are true and the game is more limited in scope, the engine may be capable of delivering a more refined experience. Actually, no, now it just sounds like it's gonna be kind of like it'll be another online spin-off that'll hopefully keep Bethesda in business while we continue to wait for the next proper entry in the series. I mean, the sources from the articles I read referenced games like RUST and Ark when talking about it, so it might have a design that makes sense in the Fallout universe, especially it makes better use of all of the utterly superfluous game mechanics they introduced in Fallout 4 that were related to town-building. I mean, I still won't play it, because screw multiplayer. I spent well over a year playing multiplayer games, only to come full circle and realized that all of these other players just exist to ruin my fun instead of enhancing it. I'll wait for Fallout 5 no matter what this turns out to be.